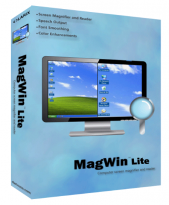 Magwin is available in three versions, USB, Standard, and Lite. 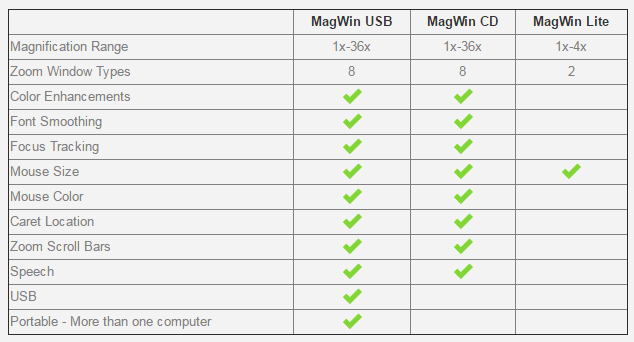 MagWin USB is truly portable and runs on any Windows compatible computer with complete mobility! Have you ever wanted to check your email or surf the web on the go? 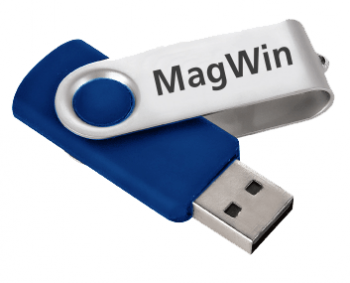 You can use the MagWin at a hotel, public library, school, even a friends or family members computer. 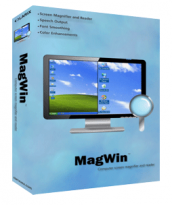 Most screen magnifiers today offer a USB version. However, not all are portable and require installation of drivers which require certain computer privileges. Public computers don't allow this. Private computers can be a very personal item that others won't appreciate you installing this type of software on. Simply attach it to your keychain and carry it with you every where you go. Just walk up to any Windows compatible computer and plug it in. Within a few seconds, it's ready to use. It's so simple. No License restrictions! No installation! Complete Portability! MagWin works when you need it to.